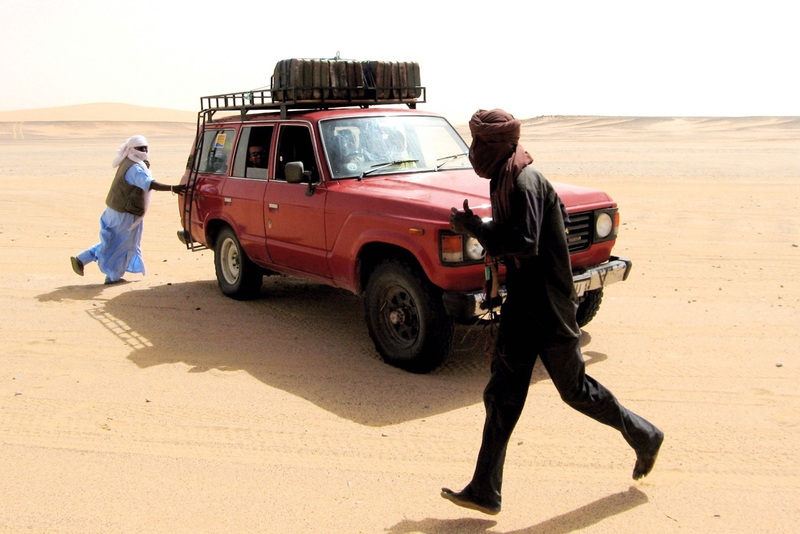 I’ve always been attracted to the simplicity of a pickup in the Sahara. 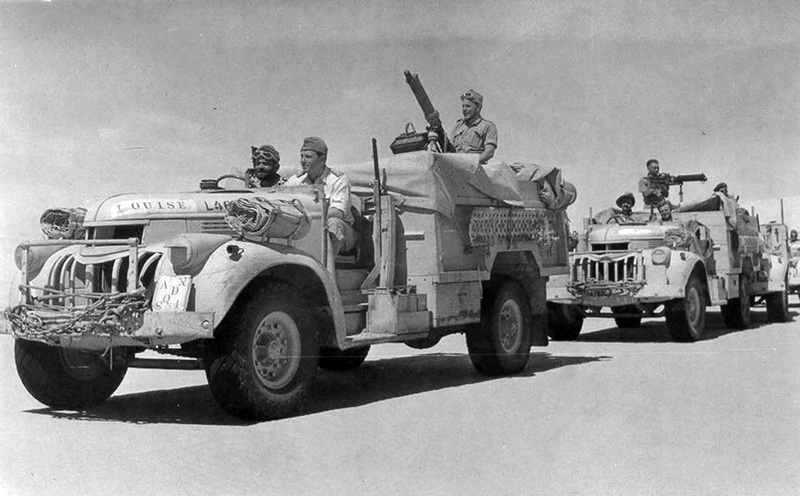 Where weather, payload security or (inside) passengers are not issues, what more do you need; a self-propelled platform with a steering wheel and a seat, just like the LRDG (left). 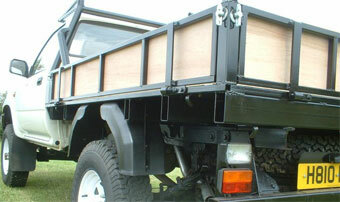 The tray behind the cab is big, loads low and is easy to get to. First choice would have been a 70 series Toyota (right) but the extreme scarcity of 70s in the UK and the expense of bringing one in from Europe or Australia meant not this time. Tojo 60s were cheap and easy to find in the UK then, and had the same running gear and engine as an early 75. 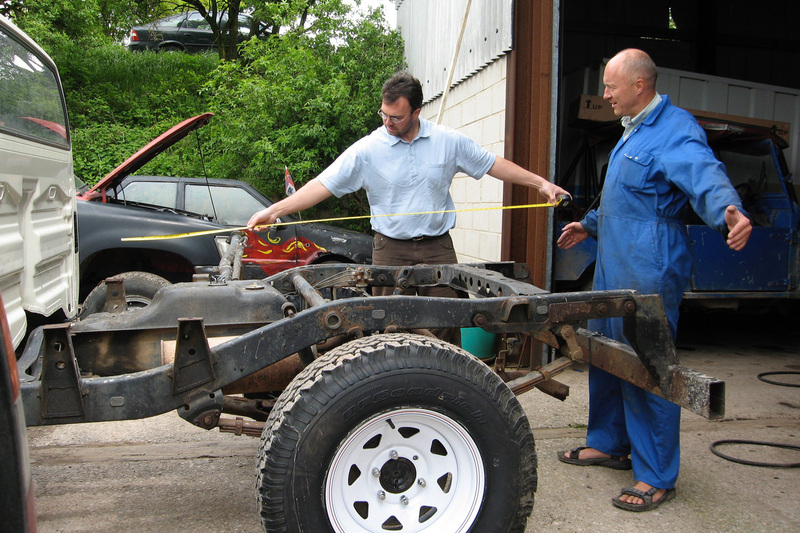 And heck, while we’re cutting off the back body, why not cut the thing in half and slap an extra metre into the chassis to make a useful, US-sized bed? So Matt collected a 60 sight unseen for 1100 quid; a TLC in dire need of more TLC. But driving it around a bit more proved it was just too shagged in the transmission to be worth investing in, so I flogged it to a mate in Niger with fewer reservations about its condition. Amazingly, I came across it a few weeks later near Bilma with a bunch of happy Eclipse punters in the back, following five days of intensive mechanical surgery in Agadez. Even today old 60s are still much sought after in the Sahara. But in the meantime I’d decided an extended pickup cut out of a 60 was not worth the din of the angle grinder. I’d always liked the idea of a Land Rover HiCap (right). If nothing else it would add a useful promotional angle to our Empty Quarter crossing which was first completed by prototype LR 101s. But even before you’ve juggled the lottery of buying an LR, the prices of HiCaps proved to be two or three times more than a Todje of the same age and in no better condition. Old Todje’s really were a bargain in the UK back then; you got a lot of car for your money. If I was working a 4×4 year-round, a TLC have been the obvious choice, but all I do is a couple of desert trips a year while the rest of the time the car (well, the sort of car I can afford) rusts and depreciates and is a dog to drive in the UK. A Hilux pickup should handle the load and landscape, hopefully scrape through the dunes where power is a premium, use less fuel and all in all, be sufficient for my needs even if it lacked the grunt of a 2H engine. 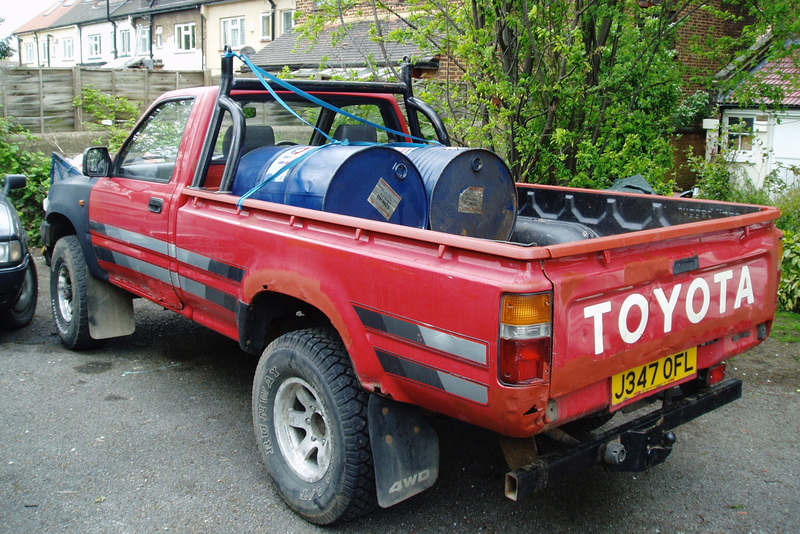 I ebayed £847.12p for a ’91 2.5 diesel Hilux (left) on its second owner with 180,000 miles. I met matey at the station, asked if there was anything I needed to know, and set off back to London, hoping I’d not bought a crate. After driving 60 and 80-series tanks, the lightness of the Lux was a treat – at 1400kg it’s 30% lighter than a 60 but with 80% of the horsepower… That’s an idealised way of looking at it. With the red Hilux’s vibrating and clanking UJ and props It was hard to tell how it really ran, but it started, pulled and braked well, kept cool and didn’t look too bad for a working pickup. 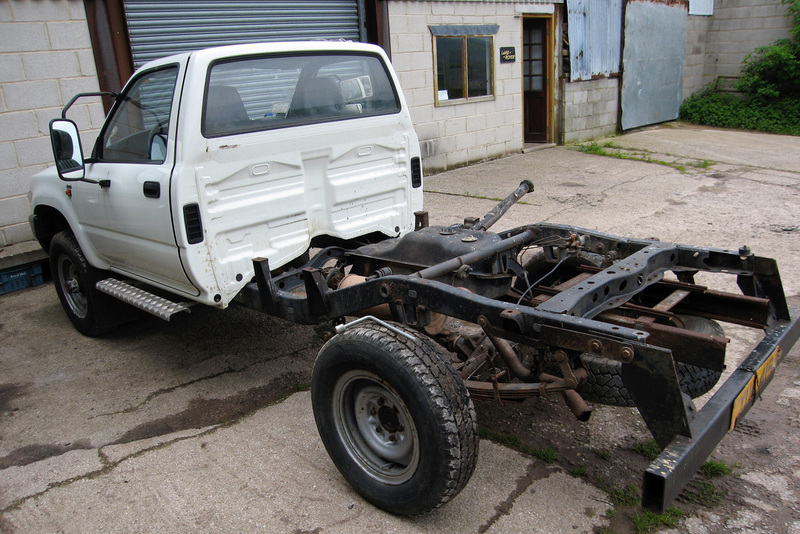 If you think TLC models are complex, Hilux are no less confusing to an uninitiate, but it seems this was a Mk 3 LN105 with 24-volt starting, leaf springs with a 4-cylinder 2.5 non-turbo engine (the turbo 2.5s found on Surfs etc are said to be head crackers). 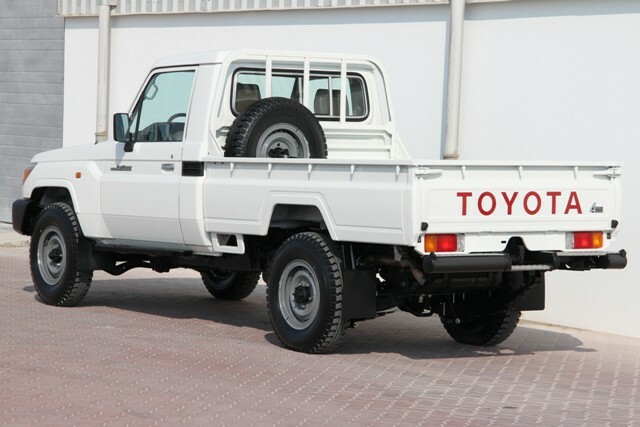 It could be the same model as the famously unkillable Top Gear Hilux. After a TLC, a Hilux’s undercarriage looks unnervingly skinny: shocks like pencils, diffs like tea cups. The crux is obviously not to drive and load it like a Land Cruiser. A closer inspection at Matt’s didn’t reveal any great dramas: filthy air filter, gravel in the tailgate, crappy rust repairs, a missing tailpipe and a UJ and prop bearing with more play than Wimbledon in June. Nothing too bent, broken or missing. With Milners just down the road, Matt set to fixing the obvious flaws. Then a Volkwagen Taro came into our orbit; a VW-badged Hilux sold in Europe during the 90s. No, I’d never heard of them either. Hiluxes (and their derivatives, Surfs and 4Runners, aka Tacomas in the US) are effectively light duty Land Cruisers, but how bad could they be for the desert? Their reputation is no worse than TLCs, they’re all over the Sahara (especially Mauritania) and there are plenty of old ones rusting quietly away in the UK. The Taro had been resting since at least 2003, another early 90s LN105 in all but badge, but obviously in much better nick and only a couple hundred quid more than the red one. Formerly used on Linda McCartney’s donkey sanctuary (or some such) with 70,000kms, LHD and missing a back tray where a cabin had sat. It had a bench seat, horrid 16″ splits and one 12v bat with space for another which suggested an African ‘export’ model. A quick drive back along quite Peak district roads with Matt’s 80 covering my bare rear proved it to be a bit gutless – the squashed header pipe we’d noticed or just the reality of an aspirated 2.4 in need of a damn good thrashing (or a turbo)? Time will tell. And of course the unloaded back bounced all over. But the gearbox felt tighter than the red one so, with less than 50,000 miles I think I’ll take the Taro please waiter. 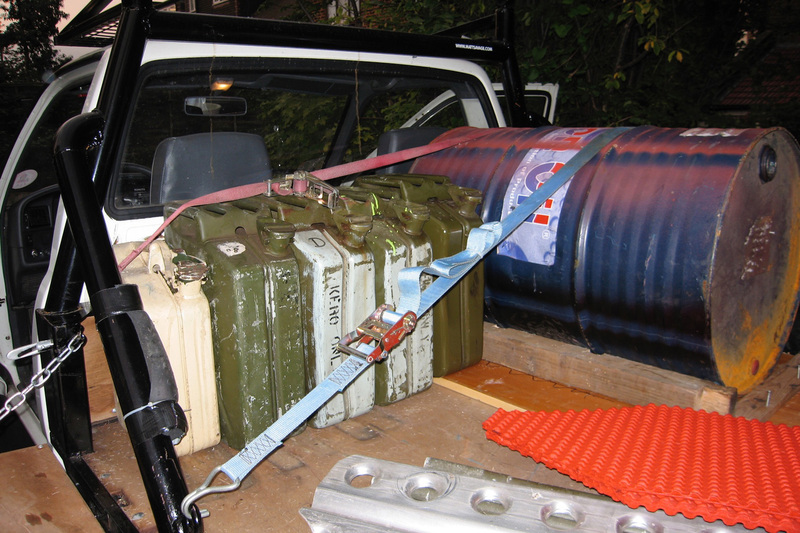 The red Hilux is heading to Niger with the white 60’s engine, box and the Taro’s springs and other spare. Matt will take the chance to steam and waxoil the back before we tuck in the new bed. • New suspension. I hoped to experiment with parabolics again but none available, so we sourced some OME springs from Italy. • 16″ steels on BFG ATs. Yikes, 6 of them cost nearly as much as the car but they do work. • A pokey 13″ 265W Kenlowe fan. 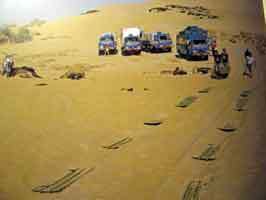 Hiluxes get hot working in dunes I’m told. • New timing belt (normally due at 100,000km). 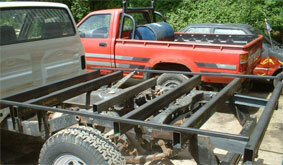 • A custom-made flatbed back tray. 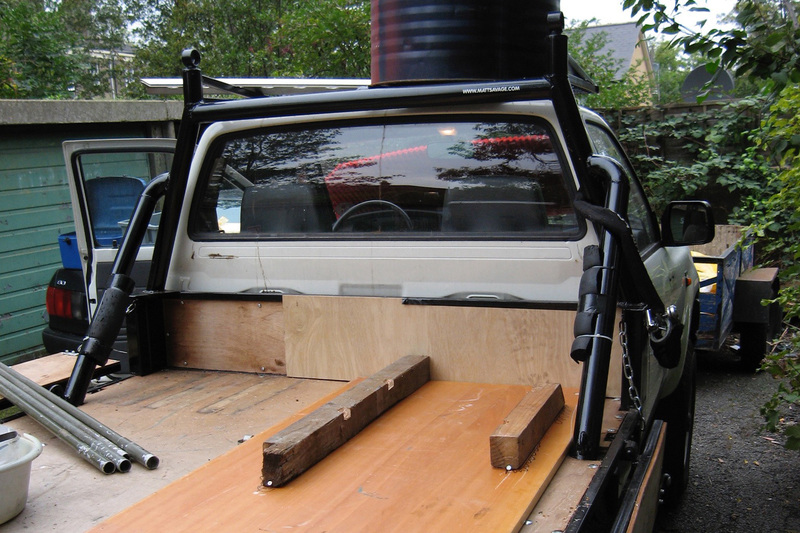 We did follow a rusty Mk 2 bed on ebay which didn’t sell for 50 quid but even at that price we thought it would be easier to start from scratch and built something better than standard. This tray is going to take some organising, but a flat-bed is easiest to make and darn useful. 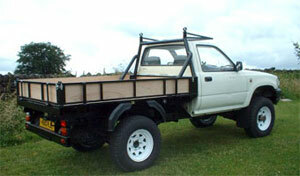 They are commonly fitted to Hiluxes in Australia. 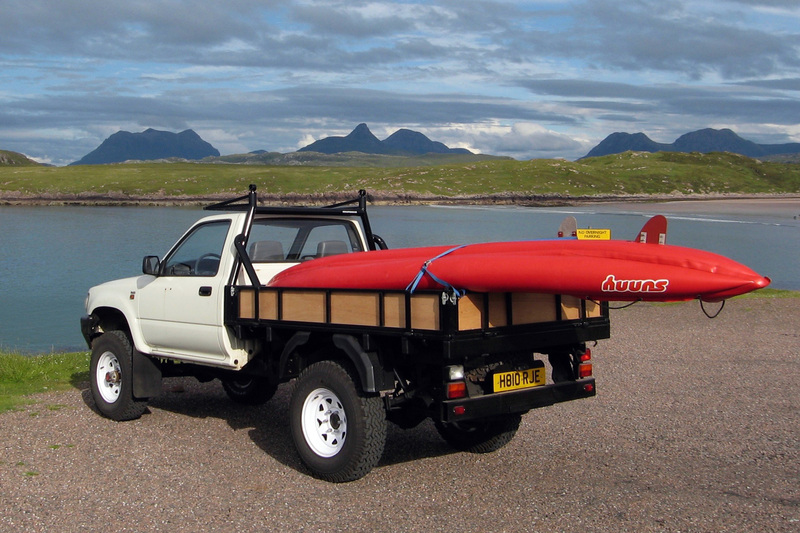 It turns out regular-tray Hilux wheel arches are much higher than they need to be, so the flatbed can be not much higher than normal. Space underneath can be used for storage, fuel or whatever. I’m still undecided if I just chuck it all in and rope it down under a tarp, or make some built-in dividers. Probably the former as the marine ply floor Matt has lined will be easy to partition. 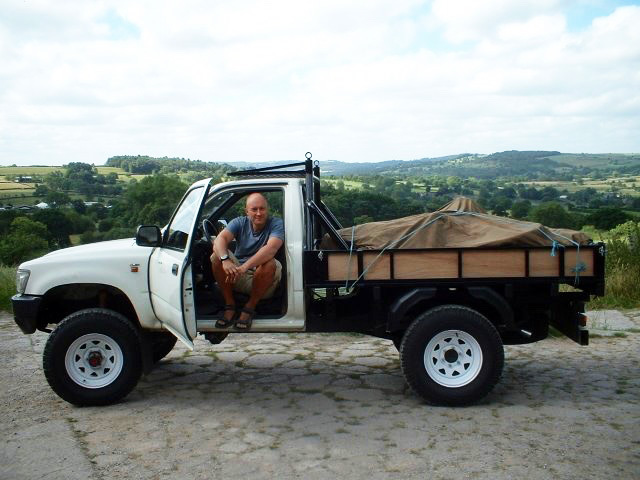 For the SEQ the simplest long-range fuel solution is a 205-litre drum which I can dump when I’ve finished with it. I found a couple outside a local garage which hopped obediently into the back to the red ute. Haven’t had a chance to pin down a 105s fuel consumption yet, but if a 4-litre 2H engine gets 15mpg (4kpl) at worst then I hope the Taro will max down at 20 (7kpl). Averaging 20 mpg for 1000 miles is 50 gallons which is the drum, the normal tank and a couple of jerries. As with all custom jobs it has all taken much more work and been fraught with complications, but I’ve been there and done that so the less I have to know about that the better. With nothing available in the UK at any price we sourced some OMEs from Italy (below right) – as usual the price was substantially less than in the UK. Along with the new BFGs the pickup was now right on its tiptoes and the barely long enough shocks were getting dizzy under the strain. This was without the full back body, let alone 400 liters of Mauritanian gasoil, so we’re hoping it will settle down a bit once it’s all built up. I do wonder if I may have gone OTT with the ‘400kg-permanent load’ springs which the VW will exceed only occasionally. Time will tell if it rides like the Forth Bridge or if we need to try and take a spring out of the back. I suppose this is where those airbag assisters would come in handy but it’s just another thing. I want to keep this one as simple as. Recognising the OME set up might lead to spinal injuries we decided to mount two spares right at the back rather than ‘Dukes of Hazard-style’ in the tray off the roll bar. Being big BFGs they take up a lot more space when they’re off the axle but as luck would have it, they just squeezed in between the back springs and pipe. 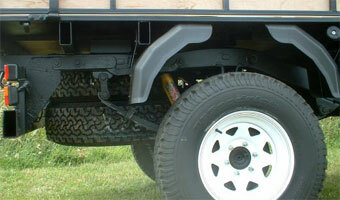 And once Barry moved the tyre-winch crossmember up a bit they fitted without buggering up the departure angle too much. To spare the tyre winch a hernia the top spare is wing-nutted directly to the crossmember on long studs while the lower, more readily accessible spare tyre is held on by the winch chain as normal. Holes had to be cut into the tray rearmost cross members to enable the crank handle to get in there. I got to thinking how is it that Tojo spare tyre winches hold the tyre in place over all terrains so securely but just simply wind or unwind on the crank handle without any rachetting or locking. Dr Matt drew on his pipe, tucked his thumbs under the unfashionably large lapels of his lab coat and explained: it’s probably all to do with worm-drive gears and ratios. A worm drive (a gear like a drill bit with spiraling teeth) actuates on a regular roundy-round gear to hoist the wheel up because the ratio is set at a Newtonian optimum. But the wheel – attached to the regular big gear by the chain – can’t undo the worm because the ratio is too high. Worm can crank up the 20kg tyre easily but tyre can’t undo the worm anywhere near as easily. That’s what we guessed goes on inside a Tojo tyre winch assembly. We could all be terribly, terribly wrong. Anyway, 40kg of tyres fitted in, out-of-the-way and give the stubborn OMEs something to think about. With that done (and a quick waxoil spray job all over the back chassis and area while it was easily accessible) Baz the Rod sprung into action finishing the back body, levelling it off on rubber mounts and filling in any holes to limit internal rust. One thing they mentioned was that when ordering steel to build something like this, it’s a whole lot less work to order exact lengths from the supplier instead of buying in a whole stock of 2 by 4 or whatever. This way the ends are perfectly cut on an ion particle saw and not at a variable parabolic 8.5° angle using your junior hacksaw and a lot of blades. 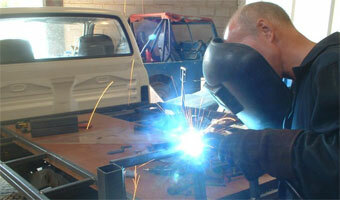 Makes butting up for welding a whole lot easier too. The tray frame then got painted and clad in 18mm marine ply. All three flaps or gates fold down but can be levelled off for use as long narrow banquet tables with corner post chains. Talking of which, the back two corner posts as well as the tops of the roll bar posts have welded on JATE rings (well actually old shock absorber ends) to help lash down motorbikes, canoes and the like. Even though there’s plenty of room in the back, it’s still handy to have things out of the way so I requested a cantileved platform/rack extended forward off the roll bar over the cab roof, giving a few quick instructions. I went up the Pennines for a few days, came back and the job was done exactly as I’d envisaged. 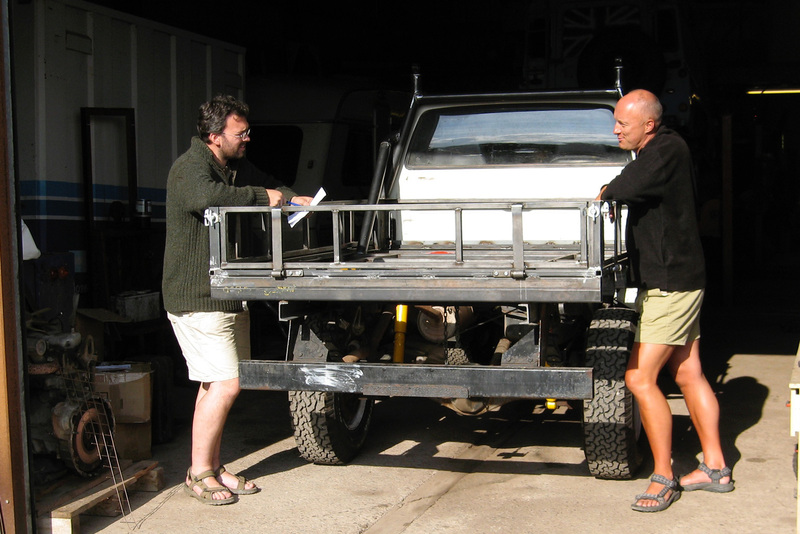 With no roof rack to hop onto, this rack will be a handy viewing platform when lost or separated in the Sahara – something that in my experience is more useful than you think. 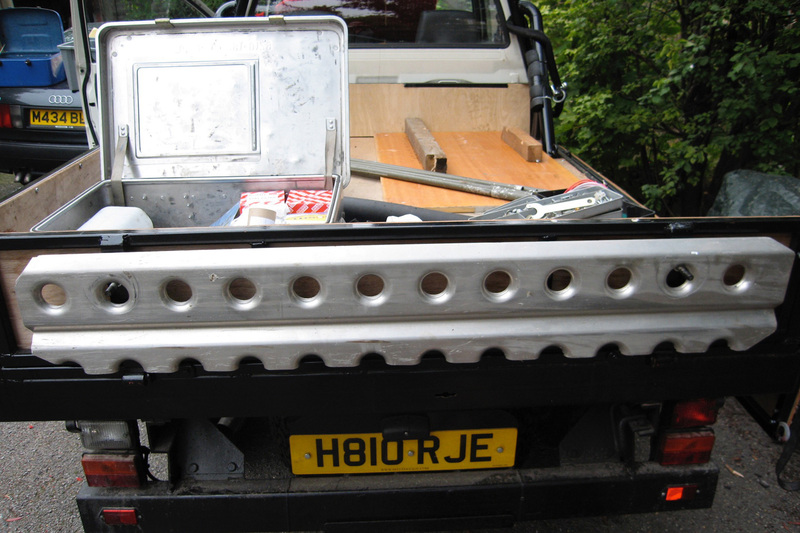 With the tray fitted and wood in place, Matt sourced some robust plastic mudguards out of a trailer and caravan catalog, sawed them in half and nailed them under the tray. They give plenty of clearance for shovelling away sand when bogged – one thing pickups have in their favour. Mudflaps to limit spray are on the list, too. Apart from lights and a number plate, that’s about it. Still haven’t even taken it for a drive but by the time you read this the VeeDub will be up in the far northwest of Scotland. Looking forward to getting an idea of the fuel consumption and hoping it will be in the high 20s (9kpl) or even low 30s (11kpl). I drove the old red Hilux back down the other night, straight to Portsmouth docks for export to Niger. Even with a Land Cruiser engine and gearbox in the back (and then some), the old banger managed to keep its speed and pull away sharply (admittedly on 205s – not 750 x 16s). And the ancient springs didn’t even bottom out. I’m reminded how, over a short range, how light and pleasant a Hilux is to drive after a TLC tank, without necessarily being any less tough. While I was away Matt fitted a second battery (left) and a what I consider a foolproof ‘split charge’ system which avoids diodes, schmiodes and gnashed teeth with two dead batteries and fries. 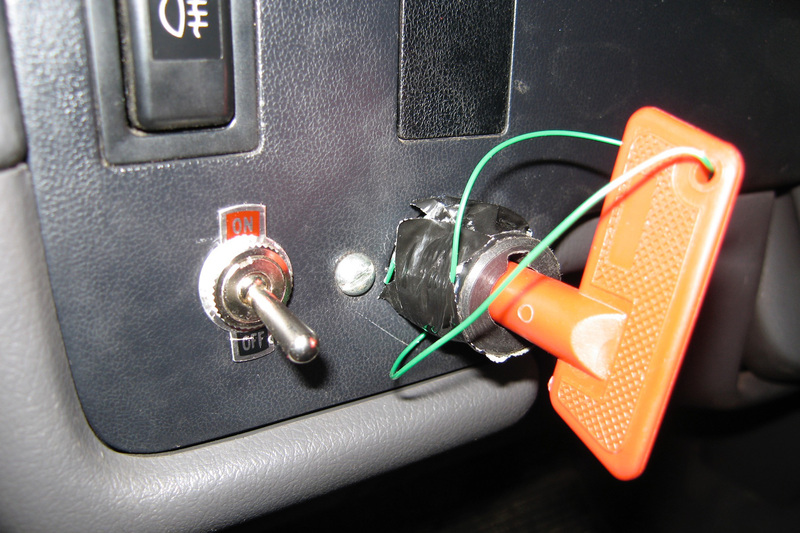 With the chunky red dashboard key in, both batts are connected and get charged off the alternator while the car is running. Come night-time or a lay over, put the key in the ash tray and the second leisure bat can be run down with ancillaries run off a dedicated four-way cig connector. That toggle switch is for the Kenlowe fan. The thermostat broke off before it even got used so it’s been eliminated but I prefer to turn the fan on manually anyway as I always have an eye on the temp needle. 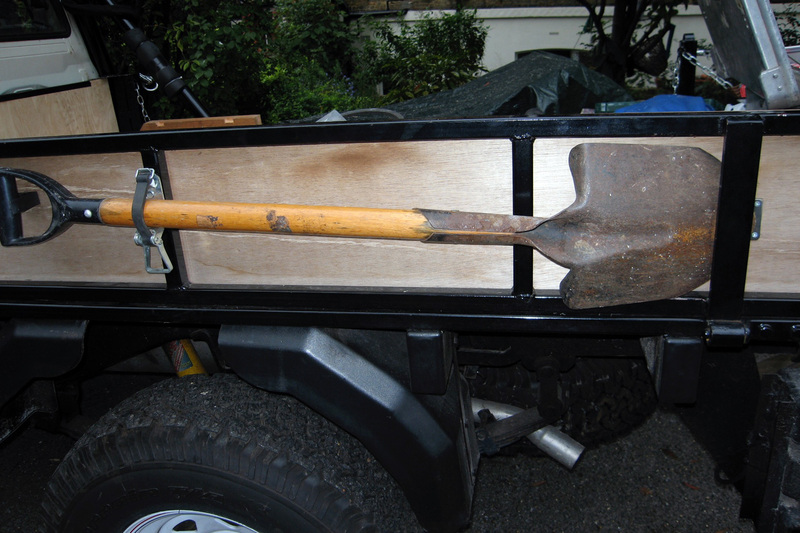 A q/d shovel has been tucked onto the side for easy deployment during boggings and for going to the bog. And on the back across the tailgate with easy-to-use screw down handles (not shown) are the ally sand plates last used during my Mercedes 190 experiment a couple of years back. These will be matched by a pair of red Soltracks which I’ve bought for all of us from France for €70 a pair. I’ve cut the corners off mine to better tuck them under cleared wheels, a la Grand Erg plates. Light and harmless, they feel pretty tough, but a few days of 2 tons mashing down on them may change that. I’ll be interested to see how they stand up to it. All these trips of mine include trying out new things and ideas for my own interest as well as the next edition of the book. The Soltracks will also make handy under mats, wind breaks, ping pong bats and windscreen shades to keep the cab cool over lunch. Tarps are always tricky to keep tied down until you get a degree in rope management so I’ve come up with a neater idea, an old fishing net bought off ebay to simply stretch over the tarp and hook down onto the sides. Haven’t tried it yet but there’s always lashings of rope it if fails – and who knows, it may have some sort of use in the desert an a communal sand hammock. I was going to take two 200-litre drums plus a jerry for measuring it out, but checking the insides of one drum today revealed some rust and water. Who knows how it got in but I can’t be bothered to trace a leak if there is one, so I’ve dumped it and decided to use one drum and a few more jerries. As it was I was thinking that two part-filled and unbaffled drums will surge undesirably, 300 kilos of diesel mounted high slopping left and right could push the car over the brink on an off-camber dune slope. 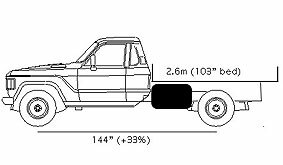 This already narrow ute has turned out higher than necessary, a combination of desirable 750 x 16 wheels and the not so necessary 2-inch lift you get whether you like it or not with with heavy duty OMEs. Too late to do much about that now but it gives me more space in the back. 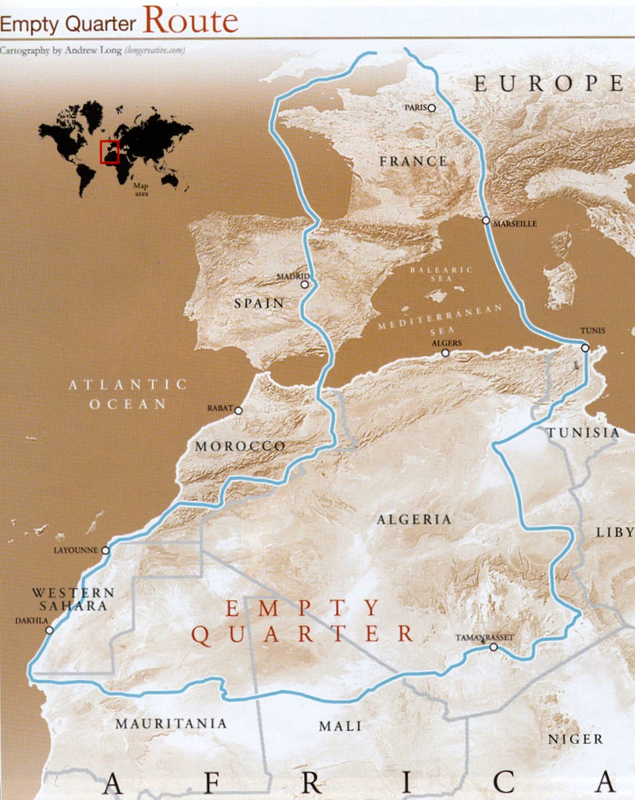 For the big stage across the Empty Quarter my car ought to easily get by on 350 litres – (2100km @ 6kpl) which is a near-full drum, 5 jerries and the fuel tank. I nailed on some blocks of wood to help keep the drum in place for the duration with the help of a chunky lorry tie down. And that is about it, baring the usual last-minute dramas. Overall I’m confident in the young Taro’s untested set up. It’s a nice light car to drive, young enough not to be shagged out and I’m sure the ease of access will have its rewards in the desert. 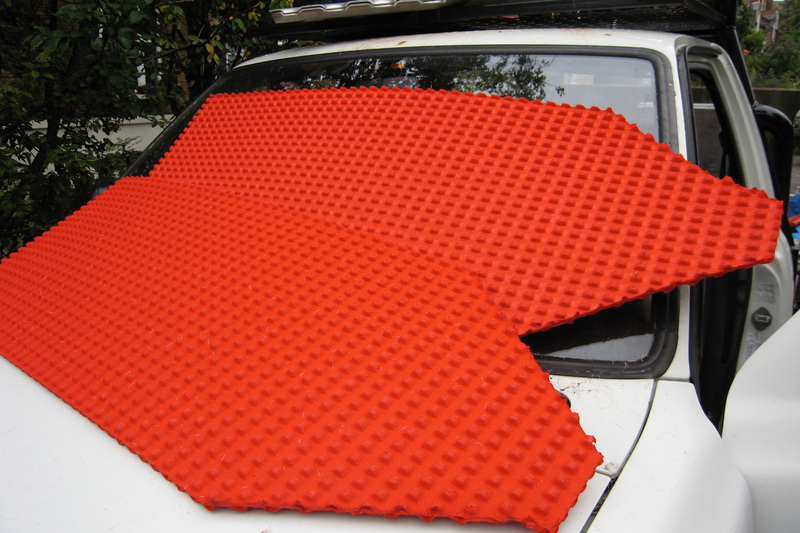 With a bit of carpet tiling on the load bed and my mattress over the top, it should be pretty quiet too. If it tips over at least it’s easy to unload and light enough to pull back up without doing much more damage. My biggest concern is the lack of power, not helped by the over-sized tyres. It’s been a few years now, but whatever I drive I think I still have not got over my HJ61’s bark-stripping grunt. The toughest section of the Empty Quarter will be getting through the Ouarane Sand Sea east of Guelb where all the cars will be maxed out on payload. A grunty 60 will manage OK, but the limp 2.4 Tojo engine will not have to poke to gain momentum to get up over the dunes. 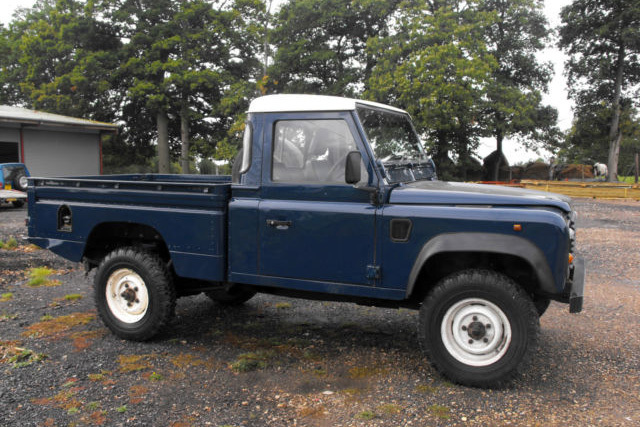 It will be like being in a Series III all over again – claw its way along, one bogging at a time! This picture of the Saviem expedition in the Aïr comes to mind. Oh well, que sera sera. If crossing the EQ was easy someone else would have done it by now. Pop back around Xmas to see how it went. Or click this.